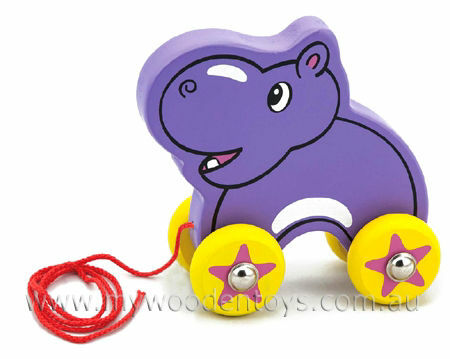 Pull Along Wooden Hippo is a sweet little purple Hippo ideal for eighteen months plus. This Hippo is very strong with metal axles and a fixed rivet wheel for extra safety. This lovely little toy has a 70cm soft red string for pulling. A classic toy for your little one to trail around after them. Size: 14cm tall x 14cm wide x 6.8cm wide. Material:Wood, Child-safe paint, Metal axle, Soft 70cm cord..
We like this because: "A classic pull a long."